Every year we make special decorations to go on our Christmas tree as well as to send to our family, along with Christmas photos of the children. This year we've put it all together to make these adorable little photo gingerbread men out of an extra special salt dough recipe. We made cinnamon salt dough a few months ago and absolutely loved it, it smelled incredible! So this time we tried adding a little something extra! We mixed all of the ingredients together to make the salt dough and then kneaded it to make a nice smooth dough. Then I split the dough into two halves and gave Ethan and Ivy each their own ball of dough to play with for a little while. I always find that when I have a specific project to do it's best to give the kids lots of freedom to begin with, that way when it's time to start the craft they won't feel like they've missed out on squishing and moulding the dough themselves. Then I asked each of them to roll out their ball of dough as flat as they could using a rolling pin. This is great for strengthening the muscles in their hands and controlling their movements. Next I gave them each a gingerbread man shaped cookie cutter (buy on Amazon UK / Amazon US) to cut out as many shapes as the could in the dough that they had rolled out. Following this recipe we were able to make ten gingerbread men altogether, which meant that we had enough when we finished to give a set to the grandparents as well. Then I used a straw to poke a hole in one of the hands of each gingerbread man so that we could thread some string through once they were finished. I also used a small water bottle lid to cut out a small circle in each of the gingerbread men's heads that will hold a photo once they're finished. Once they were all cut out I placed them on a baking tray lined with baking paper. I then bake them in the over at a very low temperature for a couple of hours as well as leaving them overnight to ensure that they are dried through. Once the salt dough gingerbread men were dry we decorated them with glitter glue pens (buy on Amazon UK / Amazon US). This was a bit of a challenge for the kids to have the strength to squeeze the glitter glue out, so sometimes I gave them a hand and helped to squeeze the tube while they drew with it. We drew buttons, bow ties and little icing wiggles along the hands of feet of our gingerbread men. We left the glitter glue to dry overnight and the next day we coated each of the gingerbread men with a thin layer of gold glitter paint (buy from Amazon UK / Amazon US) to make our decorations shiny and to seal the glitter into place. 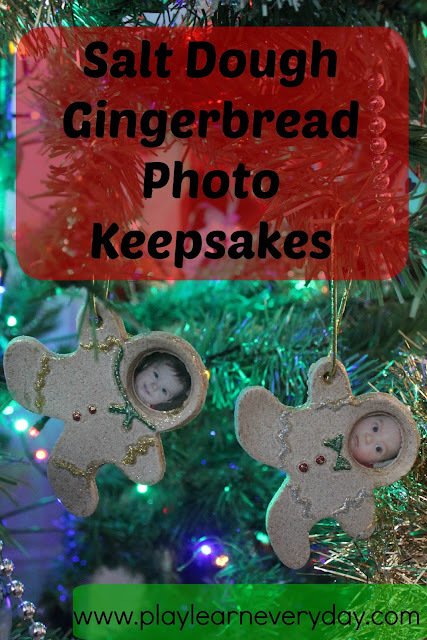 Next I chose some cute little photos of the kids to put into our gingerbread men photo decoration keepsakes. I printed them out onto card cut them out to the size of the outer circle of the gingerbread man's head. I traced this circle onto the back of each of the photos and cut along their to make them line up nicely. I put some white glue along the circle on the back of the gingerbread man and stuck the photo on. Then I left the glue to dry and threaded some gold string through the small hole to be able to hang up our sweet keepsake decorations on the Christmas tree. They look so adorable! Thanks so much, they're my favourite craft that we've done in a long time! That's fantastic, I would love to see them!